HMS ingenuity and dedication has worked with every type business to successfully process and manage its money. 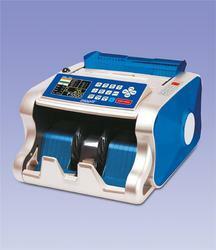 HMS currency counting machines are reliable and consistent performance even for the notes with poor quality. Capitalizing on our experience and excellent reputation in the field of money handling, the machines are designed to continually provide the superior performance demanded and expected by every operator of the equipment. 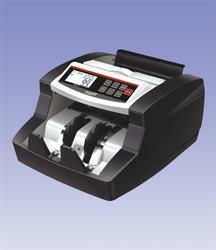 To meet the rising demands of our customers we come with a highly advanced Value Added Counting Machine. The offered product is highly renowned for its optimum stacker capacity. 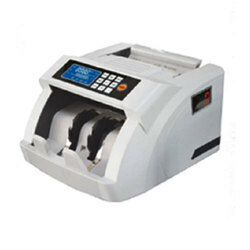 Confiding on prudent vendors for premium quality products, the entire range of high quality counting machines offered by us is assured of surpassing quality. Its robust design ensurers accuracy as well as speed. The State-of-the-art technology makes it an ideal choice. Automatically detects fake/counterfeit notes while counting using UV(ultraviolet),MG(Magnetic) and IR(Infrared) Sensors. Capable of Double Note detection with IR(infrared) Sensors. Width variation of notes is detected by Optical Sensor. Sensitivity of UV(Ultraviolet),MG(Magnetic) and IR(infrared) detecton is settable. Capable of Batching,Adding and Self-examination functions. Its robust design ensures accuracy as well as speed. Its bright LED display provides better readability. User friendly, easy to operate. Automatically detects faulty/counterfeit notes using Ultraviolet, Magnetic and Infrared Sensors. Width variation of notes in detected by Optical sensor. Capable of Double Note detection. Sensitivity of Ultraviolet,Magnetic and Infrared detecton is settable. Display : 3-digit for Current Count, 4-digit for last count, Add Count, Batch Count. LED indicators to show modes of operation and errors detected. It detects various parameters for authenticity of notes and indicates various errors observed. Modes of operation: Auto Start, Add, Batch, Bundle Check. Machine stop working beyond specific Low/High Voltages, elminating counting errors and probable damages. Detects pre 2005 Indian currency notes. Indigenous design and manufatured in India. Simple user interface makes it easy to operate. Sturdy and heavy design combined with modern electronic technology ensures acuurate counting and detection of faulty/counterfeit notes. Elegant front panel design with LCD display and backlight makes it a "dream-come-true" model. 9-key keyboard makes it easy to operate. Automatically detects faulty/counterfeit notes using Ultraviolet, Magnetic, Infrared sensors. Sensitivity of Ultraviolet, Magnetic, Infra-red and Optical sensors are settable. Clear and crisp LCD display with backlight and clear visibility from every angle. Modes of operation and errors detected are displayed on the LCD screen. Modes of operation : Auto Start, Add Batch, Bundle Check. Machine stops working beyond specific Low/High Voltages, eliminating counting errors and probable damages. Thermal Protection circuit for induction motor. Suitable for Indian currency notes. Extra LED type display containing all the features of main display panel. Modes of Operation MIX Mode, SORT Mode, DTEECT Mode, COUNT Mode, BATCH Mode, ADD Mode. 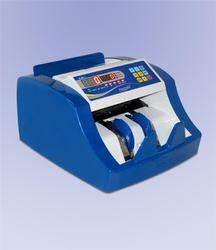 Mix note value counting machine. Sturdy and heavy design combined with modern electronic technology ensures accurate counting and detection of faulty/counterfeit notes. Colour TFT Display and 21-key keyboard provides simple user interface. LCD extra display shows Counted pieces, Amount(Value) and counterfeit parameters. Display flashes red light when a counterfeit note is observed. It shows denomination wise counted pieces and total value. Automatically detects faulty/counterfeit notes using UV, MG, IR, 3D and Colour detection while counting. Software can be updated through RS-232 port. 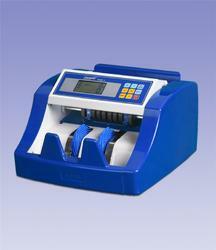 We are offering a wide range of Note Counting Machine for Bank. The offered product is highly renowned for its optimum stacker capacity. Confiding on prudent vendors for premium quality products, the offered product is assured of utmost quality. Characterized by its durability and accuracy, the whole range of high quality bundle note floor models offered by us is widely applauded.